Access your Attache and PowerLink data on your smartphone, tablet or browser. Need mobility? 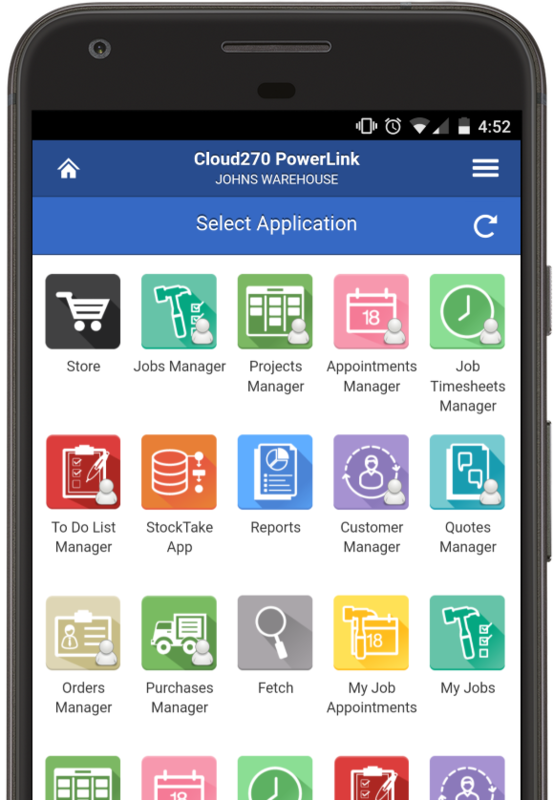 Access jobs, appointments, timesheets, stock details, to-do lists and more on your Android, IOS (Apple) or Windows Phone smartphone or tablet, or via your browser. Data is live and real-time. Changes you make are instantly updated back at the office, saving time and keeping others in the loop. Select from Cloud270's gallery of powerful apps or talk to us about your custom needs. Install the Cloud270 message service on your local server and you can instantly share Attaché and PowerLink data securely with any Cloud270 app. Cloud270 communicates directly between the device and your local server, so information is live and up to date. Data entered in the field is immediately available back at your office. Your data remains on your local server. Communication is via an encrypted secure sockets layer (SSL) connection, so no-one can see it except your authorised users. Use the Console to add users and grant them access to the apps they need for each company. If a user loses their device or leaves your employment, you can instantly disable their access. Cloud270 is created by YearOne, the developer of PowerLink. Our development team can customise existing apps to meet your needs, or create new apps if you have a specific requirement. Custom apps aren’t restricted to Attaché and PowerLink data; Cloud270 can also access data held within other systems. Contact us about your needs. John runs a plumbing business with help from Sharon, his office manager. Business growth is putting pressure on Sharon as she tries to manage the plumbers and the billing. Learn more about Cloud270 and how it helps John and Sharon improve their processes.